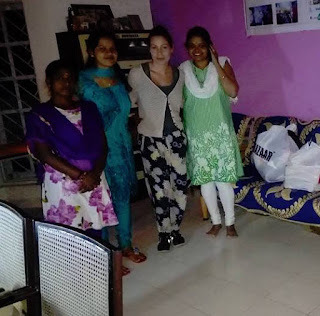 On the 21st of December I headed out to the girls in the shelter, to deliver christmas donations that I was able to buy thanks to many caring people back home and here in Bangalore. We did it last year, and thankfully we could do it again this year. It is truly a gift and blessing to be able to help others in need. Thanks to all donations hair oil, sanitary pads, shampoo, dosa phava and some other pots, inner wear, sweaters and some other clothes, toys, combs, chocolate and biscuits could be delivered. So far, during December, approximately 50 000 INR has been raised. Funds will also be used for material for vocational training, so that the girls can become self sustainable and live a dignified life. The IT-company Indpro also told us today that they want to commit with monthly support. This we are very grateful for! Unfortunately I had a huge problem with transportation, so I had to rush in and delivered the gifts, otherwise the driver did not want to take me back, and I had a midnight plane to catch. I will see the girls in early January, then we can spend some more time together. I always like to hear how the are, and if they need anything special. Thank you kindly all of you who donated, the girls in the shelter really care that others care about them! Merry Christmas and Happy New Year to you all! Hopefully the new year will bring more happiness to less fortunate people - we can all try and do our best to help along the road!